Yesterday, I had the opportunity to watch this movie in the cinema. Actually, I'm on an assignment outside my office. But I get permission to go back to Jakarta in the afternoon to pray then back to Bogor the next morning. Last night is what Balinese Hindu called Purnama (the fullmoon). It is believed as a good time to pray so I take this chance to went to Pura Aditya Jaya Rawamangun. Unfortunately, my shoes got ripped. And as I was in Plaza Atrium to buy a new shoes, I think,"hey, why not also go to the cinema?". I'm so glad I did because Dawn of the Planet of the Apes is a great movie. This film is a glimpse of the beast within ourselves. It reminds me a little about the recent attack of Israel to Gaza. Why human always war torn, at conflict? It show us that the real source of conflict are fear, cynicism, greed, hate and revenge. I think this movie mirror to our deeds in the past and the present. It resonate far beyond what any mere Science Fiction premise would let you expect. This movie is a sequel to Rise of the Planet of the Apes, a reboot of the Planet of the Apes franchise. But don't worry. You don't have to watch the previous movie because the introduction is quite clear. 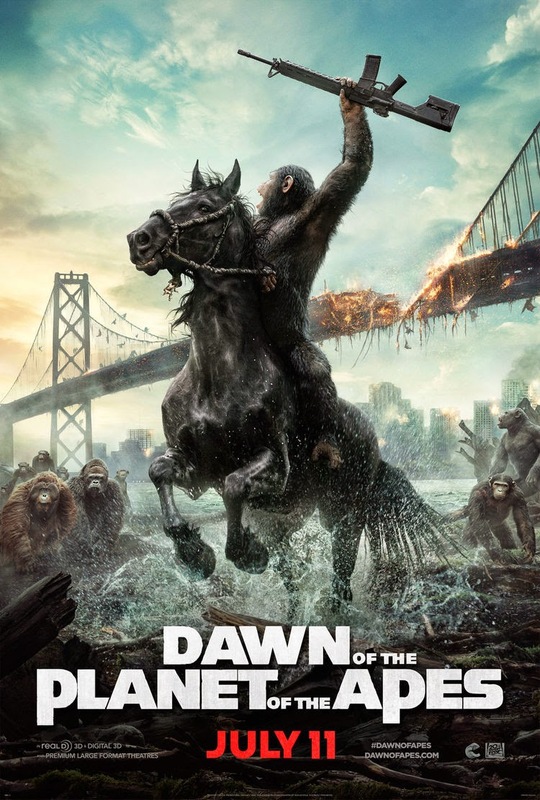 Even though I still recommend you to watch Rise of the Planet of the Apes because it is a good movie. It has emotional depth that exceed my expectation. Rise of the Planet of the Apes tells a story about how a group of apes evolve into intelligent beings (can speak and think like humans do) and how a virus spreads across the globe infecting the entire mankind, threatening their existence. Dawn of the Planet of the Apes is set 10 years after the 1st movie. It tell us the story when millions of people die due to the infection hence only small group of human lives while the apes are beginning to build a new civilization (and the clash between these 2 different species). I must say that as the middle film, it does a perfect job at telling its own story while connecting to the past and leading to a future. I really like this movie. It's a visual masterpiece! You almost forget that those apes on screen is not real but a CGI (with help from motion-capture technology)! The music score fits and reflects the drama on the screen perfectly. I love the cinematography and the action scenes. It's not those over-the-top action scenes like you generally saw in blockbuster movie. It's a gritty portrayal of conflict between human and apes, and it's heartbreaking. But the thing that I love most about this movie is the great storyline. It's highly relevant, interesting and open a lot of thought. I also love the characters. I must say that Caesar is one of the greatest leaders that I ever saw in movie. When he is on screen you can't help but be mesmerized with his character. Andy Serkis is one of my favorite actor (Gollum, anyone?) and he had a great job in bringing him to life. 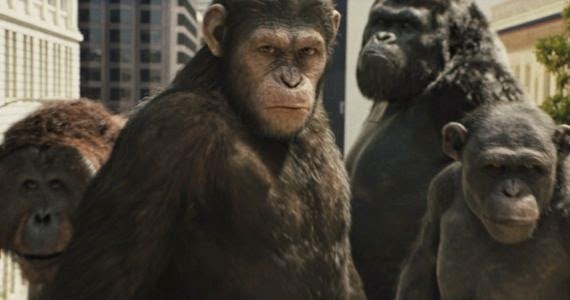 All the apes characters in this movie are amazing, their facial expressions looks real. If I have a little complaint about this movie, I think it's because the human in this movie somewhat lack character development and not as engaging as the apes characters. But they still engaging and believable characters. The ending was unexpected, visually dazzling, and emotionally fulfilling. I don't know about you, but for me this movie has a soul. Overall, I'm proudly said that this is one of the best movie that I ever saw. Watching the conflict in this movie is like watching an active volcano that slowly preparing its eruption. You really don't want it to erupt, but you know it will erupt in the end. And when it did, it did with a beautiful blast that make me emotionally devastated. Ah, I'm really bad with metaphor. Anyway, please do yourself a favor and watch this movie as soon as possible. It stays true to the spirit of the original series while delivering a compelling and bold new vision. Good review. Thanks for this review. I like it.